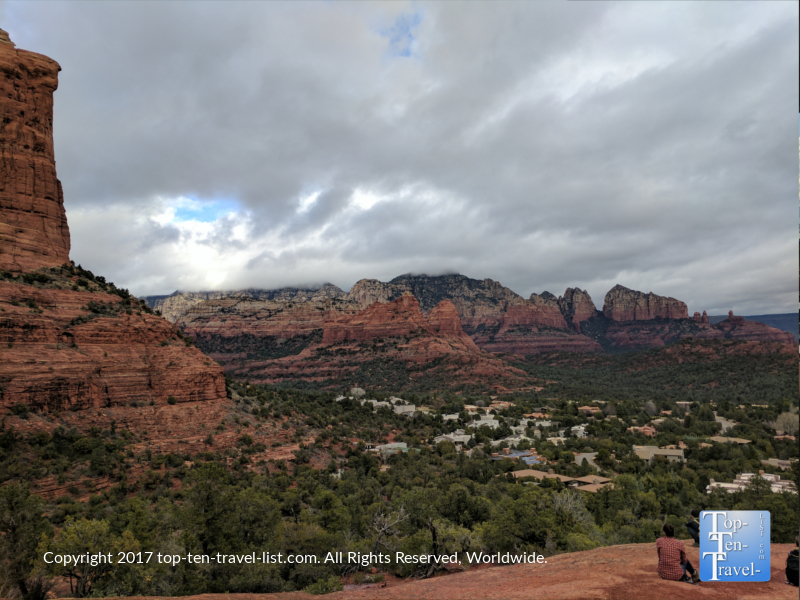 12 Stunning Sedona Hikes with Spectacular Views - Top Ten Travel Blog | Our experiences traveling throughout the US. 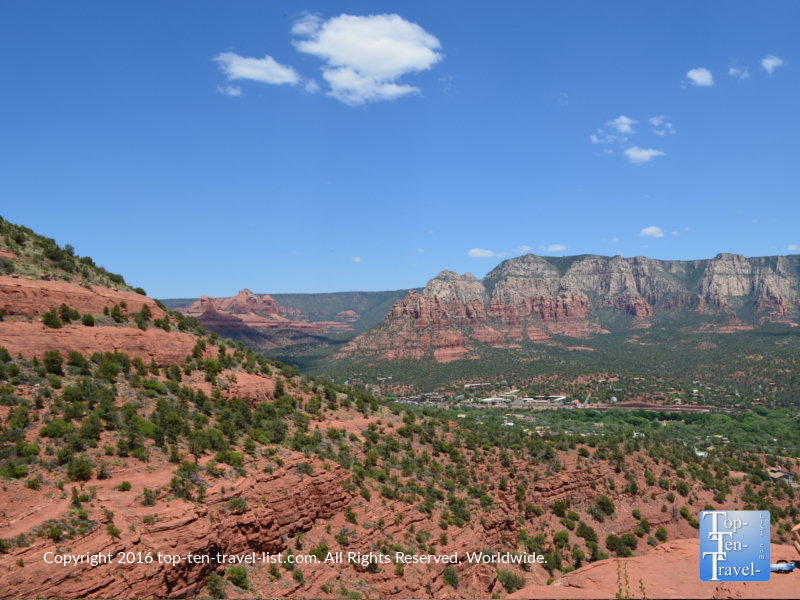 It’s no secret that Sedona is home to some o the most jaw dropping scenery in the country. Known as Red Rock Country for the colorful red rock formations that dominate the landscape, Sedona is increasingly becoming a popular vacation & 2nd home destination for photographers, nature lovers, hikers, & mountain bikers. 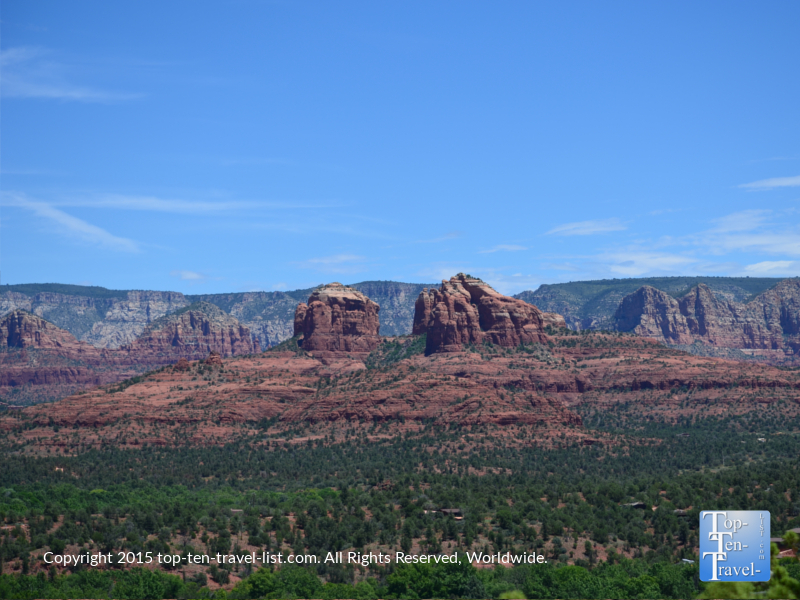 Sedona is home to hundreds of miles of trails, some easy, some difficult, yet all loaded with magnificent views of the surrounding million year old ancient rocks. With so many spectacular hikes to choose amongst, picking out a fantastic hike suited to your ability level can be quite an overwhelming trip experience, especially if you have no idea in mind beforehand. 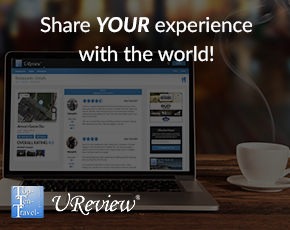 To prevent yourself from unnecessary research and unnecessary time wasting trips to the Visitor’s Center during your vacation (lets keep it relaxing! ), I have compiled a list of my 12 favorite hikes in Sedona by narrowing down the list to those with the most stunning views. These 12 hikes are the best of the best in an area overloaded with so many picturesque trails. 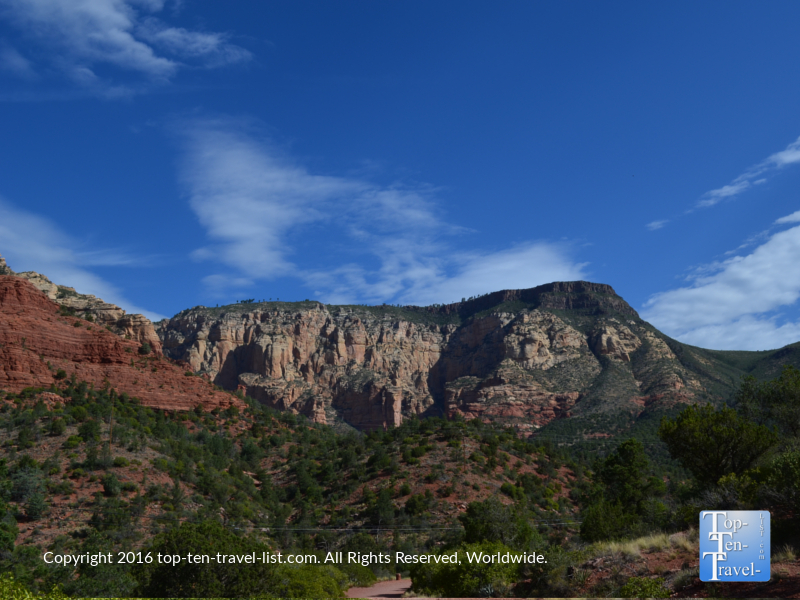 Enjoy your vacation and be sure to pick out a trail or 2 from my list to ensure that you enjoy the best Sedona has to offer! 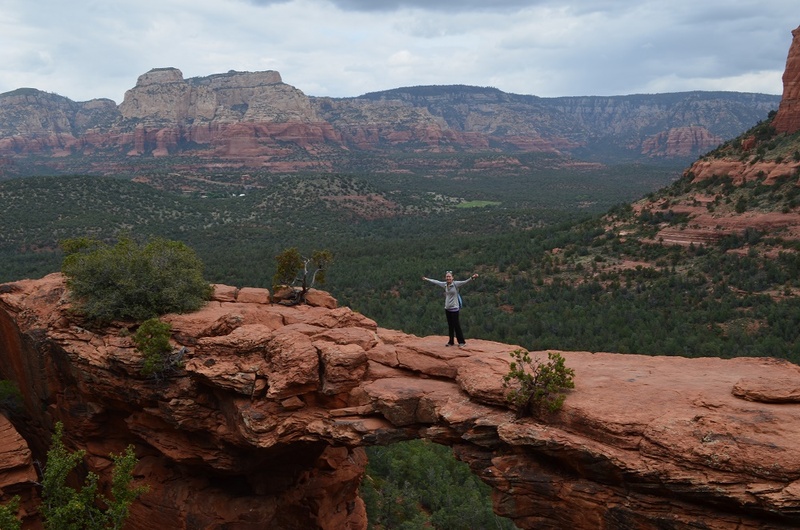 Devil’s Bridge is by far the standout trail in Sedona, and the one to do if you are limited on time. While not the easiest nor hardest trail in town, Devil’s Bridge definitely wins the award for offering the most jaw dropping views. What makes this trail so fascinating is the incredible ending view of Sedona’s largest natural sandstone arch, one that you can actually walk across and take some cool photos on (that is if you are not scared of heights!). The 2 mile round-trip (6 miles if you do not have a high clearance vehicle as you will have to park at another trail head) is a moderately easy journey with a few steep inclines and scrambling up rocks to get to the ending arch. The hike is relaxing (despite the popularity) with plenty of wide open vistas of the gorgeous rock formations. Standing on the arch while having someone take your photo on the other end is the number 1 must-do in Sedona: a fantastic souvenir photo that beats any man made souvenir in the tourist shops dominating Uptown Sedona! Distance: 1 mile out-and-back from the main parking lot (requires a high clearance vehicle & is almost always full) or 3 miles out-and-back from the Dry Creek Vista trail-head. The Cookstove Trail is one of the little known gems in the area, most likely due to the easily missed location along Oak Creek Canyon drive. A minuscule trailhead sign does not help matters, not to mention the fact that most tourists are so absorbed with the magnificent views along Arizona’s most scenic drive that it is very easy to miss the sign. A peaceful hike with amazing overlooks of the entire Oak Creek region, the Cookstove is a must-do for anyone up for a challenge. And a challenge it is, as this hike requires a 0.7 mile steep climb. 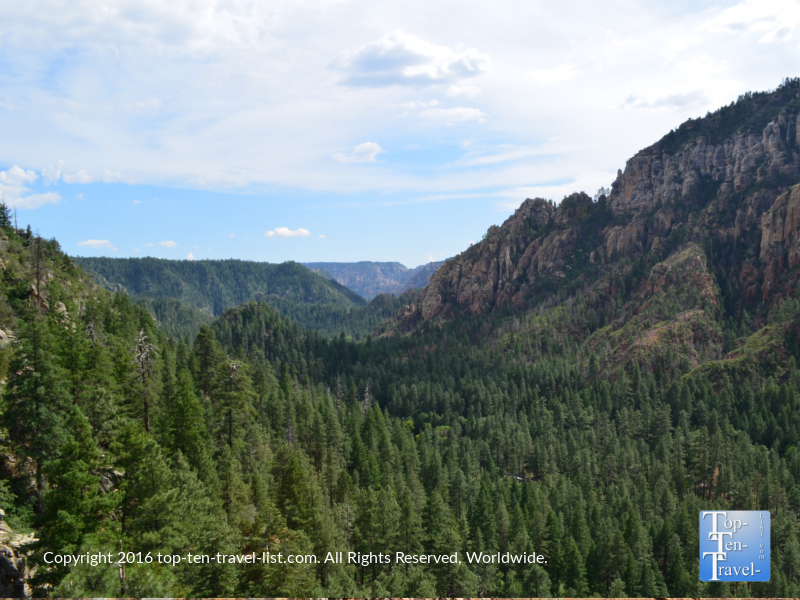 Keep on going and you will be rewarded with magnificent panoramas of the entire Oak Creek Canyon area, a diverse ecosystem consisting of colorful rock formations and lush green forests of ponderosa pines, sycamore, and cypress trees. 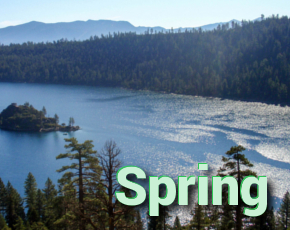 For your immense effort, you will enjoy some of the top views of any hike in the Northern Arizona region. And do not forget to fill up your water bottle with natural spring water at the tap just across the road (also where you will park your car). Treat yourself to a healthy breakfast at Indian Gardens pre-hike, located just a few miles down the road. Location: Milepost 387 on Hwy 89a (Oak Creek Canyon drive). Notice the parking area near the spring water tap (you will see many other cars parked along the side due to the popularity of this natural spring). Sedona’s Teacup Trail is what I consider to be one of the best values in town for several reasons. This hike is close to town, does not require an annoying drive down a dirt road to get to the trail-head, and offers some stunning scenery without any steep climbing required. At just a little over 2 miles round-trip with just a few minor inclines, it is pretty much easy enough for the beginning hiker. The nice aspect of this trail is the unique scenery – you really get to enjoy some views here that you will not find along any of the other trails. 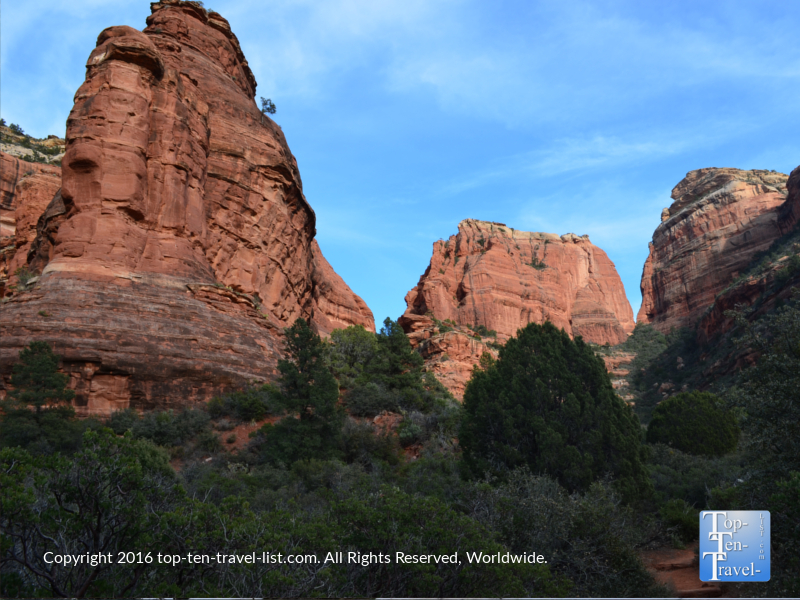 Along this fabulous trail, you will get to take in so many of Sedona’s stunning rock formations, all of which are named after the shape they resemble. This hike in particular will give you the best views of Coffeepot Rock named as so because it resembles a coffeepot. If you look closely at the photo above, you can make out the coffee spout and lid. For a shorter, more scenic, & a more of a challenge, you have the option of connecting this trail with the Sugarloaf Summit trail, where you will climb a steep, yet short 0.2 mile climb up to an amazing overlook with more breathtaking 360 degree red rock vistas in every direction. It’s a must if you are up for a little more of a challenge. Airport Mesa is one of 4 Sedona hiking trails considered to be a vortex site. Those of you who have visited Sedona likely already know the meaning of a vortex. 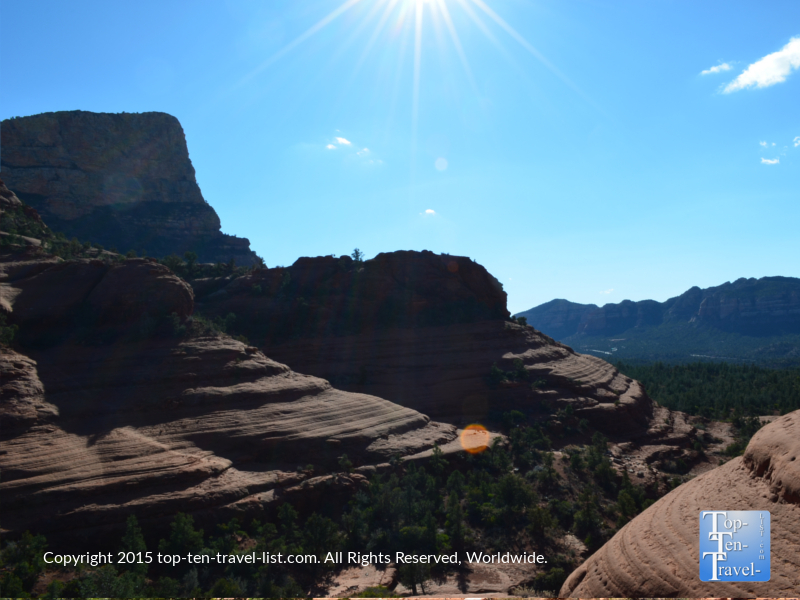 And, if you have never visited Sedona before, you will likely know what a vortex site is before you leave. Pick up any visitor’s brochure, browse through a local paper, or stop in one of the specialty stores around town, and you are bound to come across the term at some point. A vortex is basically believed to be an area of intense concentrated energy rising from the earth supposed to provide healing & energy balancing to whomever comes across it. These sites have become very popular in recent years as more and more visitors report a sense of healing & inner peace when coming in contact with these powerful natural energy sources. The New Age community continue to grow, and those seeking spiritual healing continue to make Sedona a spiritual vacation destination. Airport Mesa is thought to be a masculine vortex (vortexes are either masculine or feminine), which means that you may feel energized or motivated when you complete this hike. Feminine vortexes (like Cathedral Rock) are said to be great for those seeking relaxation. Asides from the purported vortex energy benefits, Airport Mesa happens to be one of the most stunning hikes scenery wise. It also happens to be one of the top spots in town for taking in a magnificent Sedona sunset. This hike is not one for scaredy cats as there are some really steep narrow sections in the beginning, so be forewarned. Recently saw a few people mountain biking and not quite sure how they survived! 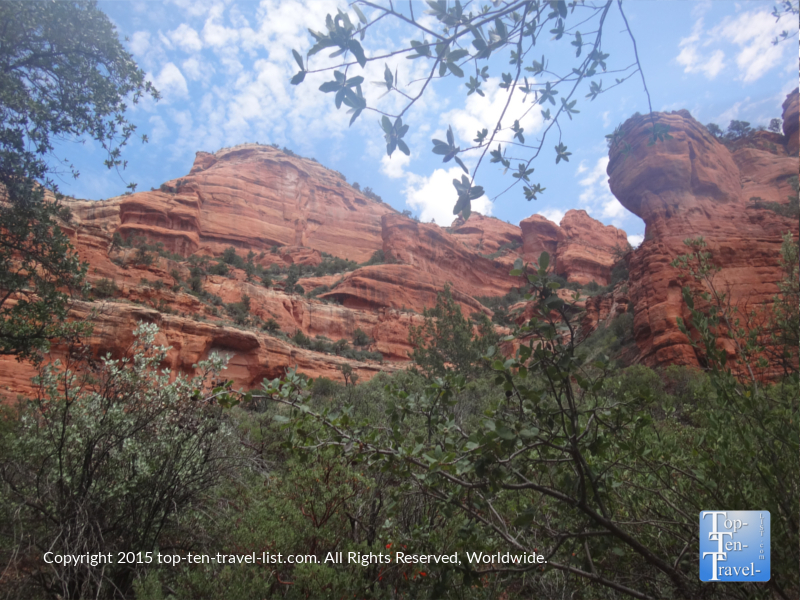 This trail is really inspiring with 360 degree views of almost all Sedona’s red rock formations in one location. I also really love all the gorgeous flowering prickly pear cacti lining the trail. Distance: 3.5 mile loop (Note you may have to park in the overflow lot and complete a short side trail to get to the main trail, adding an extra 1.2 miles to your total). Fay Canyon is a short little trek which really packs in a lot of big views despite the quick distance, a short-but-sweet hike if there ever was one. For anyone seeking an relaxing, low key trail, Fay Canyon is one of your best bets. Although it is one of the easier trails in town, it also happens to be one of the most picturesque. Towering red rock formations and a stroll through the lush Red Rock Secret Wilderness (consisting of a diverse ecosystem of plants), along with opportunity to see wildlife (notice the black bear warning signs!) 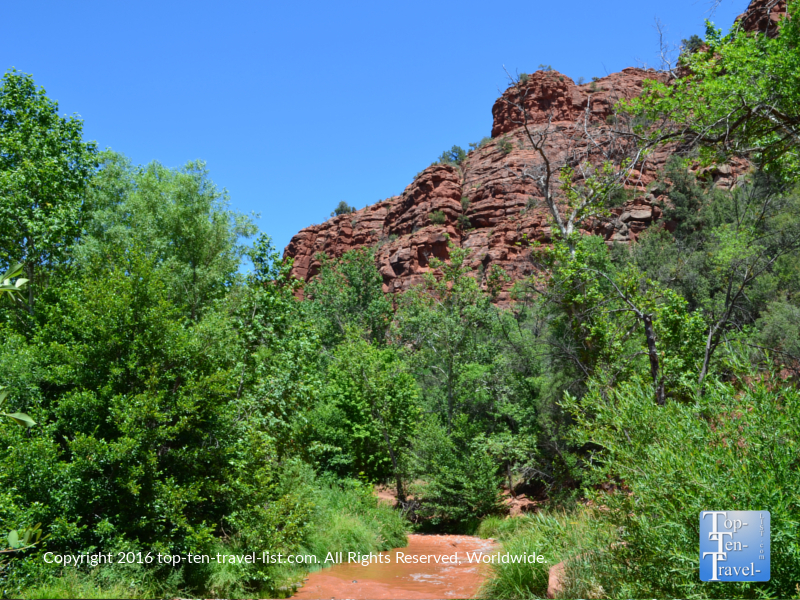 greet you on this wonderful 3 mile journey through the Sedona wilderness. A short detour about a 1/2 mile in takes you to a natural arch where you will enjoy more fantastic views. It makes the hike a bit harder, but is worth the extra effort if you are looking for a bit more of a challenge! Soldiers Pass is one of the more exciting trails in Sedona as you will get to enjoy a number of interesting natural features including 7 sacred pools (a series of 7 natural pools carved out of the sandstone), 3 natural arches, and Sedona’s most active natural sinkhole. On an interesting side note, Apaches and Yavapai tribes considered these pools sacred because they were a source of year round drinking water in the arid desert. This trail is a bit long at about 2.25 miles each way, although the hike itself is relatively easy with no major climbing involved. It’s close to town, although tends to stay a bit quieter than the more popular trails, thus making it a peaceful oasis anytime of the year. This trail is unique as the landscape changes quite frequently, as you find yourself leisurely strolling through the leafy, shady Red Rock Wilderness one minute, and then venturing out into the wide open vistas and enjoying the amazing red rock formations the next. It’s a must-do for anyone seeking a relaxing longer hike with gorgeous diverse views & unique natural attractions. Location: Rim Shadows Drive Sedona, AZ 86336 (Drive 0.2 miles on this road until you come across the gated trailhead). Little Horse is an enjoyable little Sedona workout, which happens to be popular with both locals and first time tourists. This trail is just 3 miles and pretty flat, making it suitable for hikers of all skill levels. Because it is so short, it should not take you more than 1.5-2 hours, meaning you will have plenty of time to explore more in Sedona as opposed to being knocked off your feet for the rest of the day. It is one of the better choices for new Sedona visitors as the trail is quite enjoyable with magnificent scenery & is well marked (unlike Soldier’s Pass and many others). As an added bonus, the trailhead parking lot is rather large, so you usually do not have to wait for a spot. 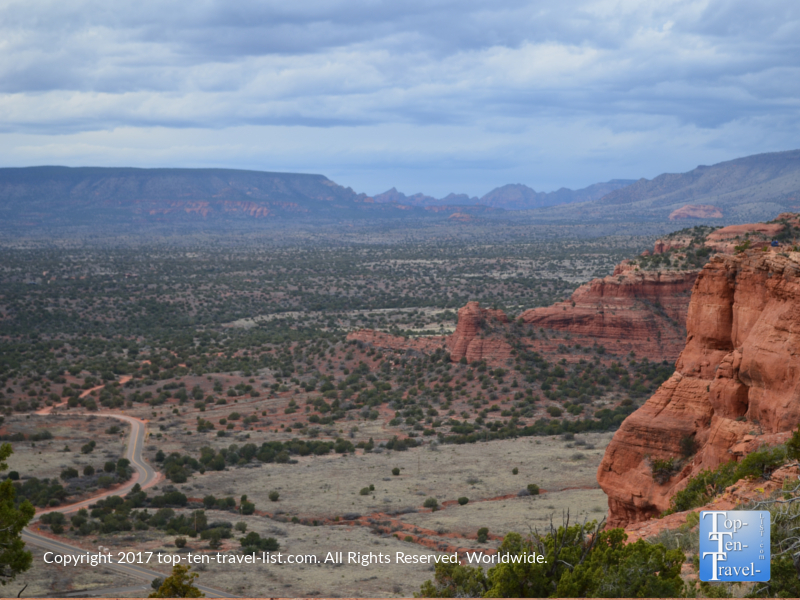 Beautiful views of the notable Courthouse and Cathedral Rock formations will leave you in awe along the way. The ending view known as Chicken Point consists of an absolutely stunning overlook with red rocks surrounding you in every direction. Take some time to savor the views for a bit before continuing on with the return journey! Doe Mountain is a wonderful intermediate Sedona trail which involves climbing 0.7 miles to the top of a mesa, with great views going up, and even better views atop. It’s a gorgeous hike with a bit of a steep climb up a series of switchbacks, although not all that difficult considering the stunning views and few crowds. 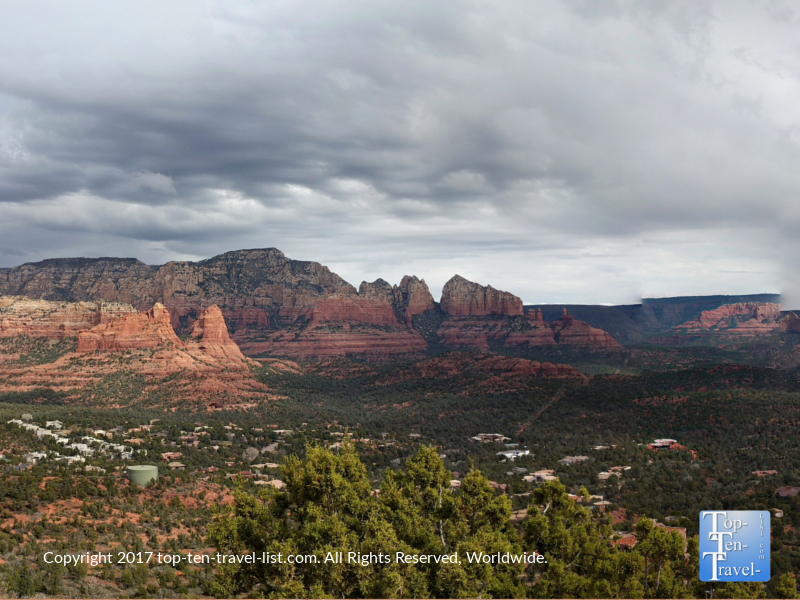 From the top, you will enjoy 360 degree, uninterrupted views of so many wonderful Sedona landmarks including Wilson and Bear mountain, along with Boynton and Secret Canyon. For stunning red rock scenery without totally exhausting effort, peace & quiet, ease of parking, and low congestion, Doe Mountain is your best bet! Boynton Canyon, a picturesque trail through a box canyon, is one of the most exciting and diverse trails in the area. As the elevation varies throughout this trail, it is not rare to find yourself sweating in the open red rocks one minute and then possibly walking through a forest of snow the next! The gorgeous forest scenery includes a diverse assortment of trees including ponderosa pines and oaks, and is one of the few areas to see colorful fall foliage. Black bears and mountain lions both call the area home, although you are unlikely to see these shy creatures who tend to avoid humans. The trail is a bit long (about 6 miles round-trip), although the journey is very relaxing with rewarding views all around, especially near the ending climb! Like the Airport Mesa trail, Boynton Canyon is also a vortex site. Boynton Canyon is said to possess both masculine & feminine energies, providing a yin/yang balance. Whether any spiritual energy actually exists, the hike itself is energizing and refreshing, giving you the rare opportunity to enjoy a variety of exciting landscapes, ranging from peaceful wilderness forest to colorful red rock vistas. Red Rock State Park is definitely the area’s overlooked hidden gem. For some reason, it does not draw nearly as much traffic as you would expect. At Red Rock, you’ll find 5 miles of family friendly trails which are well marked and easy-moderate in intensity. Eagle’s Nest Loop is the most scenic of the bunch. Oak Creek flows through the park and provides a unique habitat for both plants and wildlife. Birdwatching is popular here and all sorts of wildlife including javelina and bobcat are frequently spotted by visitors. On a side note, Red Rock SP offers a variety of fun family events throughout the year including guided hikes. Be sure to check out the schedule during your visit as these guided hikes are an excellent opportunity to learn more about the diverse landscapes in Sedona. Eagles Nest consists of a 2 mile trek to the highest point in the park. Nothing too difficult here, and the views are incredible – it’s a great bang-for-your-buck trail! Any new visitor will definitely want to plan a visit to Red Rock SP – it’s the perfect way to start your trip. Trails range from a easy 1/2 mile trek to a more challenging climb to Eagle’s Nest, or you can connect them all for a 5 mile loop. The Templeton Trail at Cathedral Rock is a nice short & less risky alternative than the challenging (and scary!) scramble up Cathedral Rock (especially for those not keen on heights). While completing the challenging climb up Cathedral rewards with awe inspiring scenery, it is a bit scary & even dangerous. 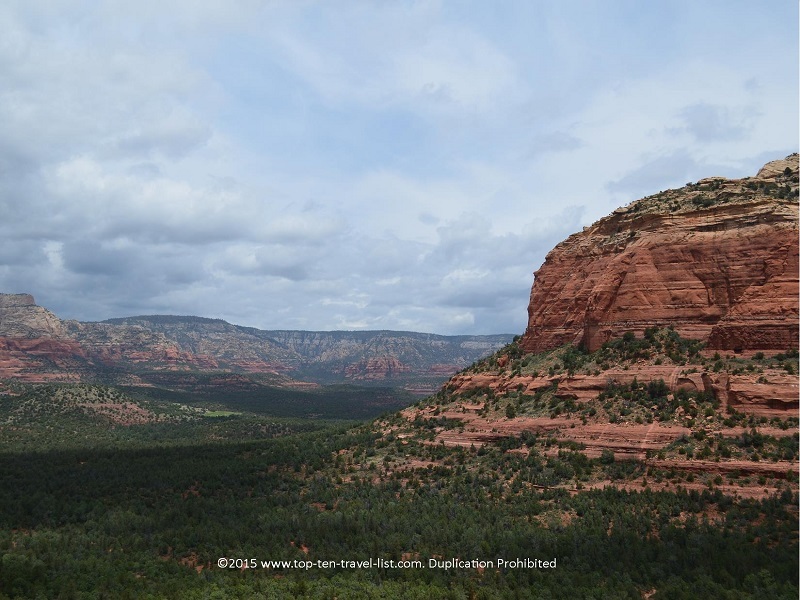 The Templeton is a worthwhile scenic alternative, a hidden treasure in Sedona as it is passed over in favor of the Cathedral hike by almost all visitors, thereby making it a local favorite! With lush greenery, gorgeous views of flowing Oak Creek, and of course, stunning red rock scenery, Templeton is just as scenic (and even more so due to the creek views) than the more popular Cathedral. This hike wins the award for most relaxing due to the picturesque creek views and low foot traffic. 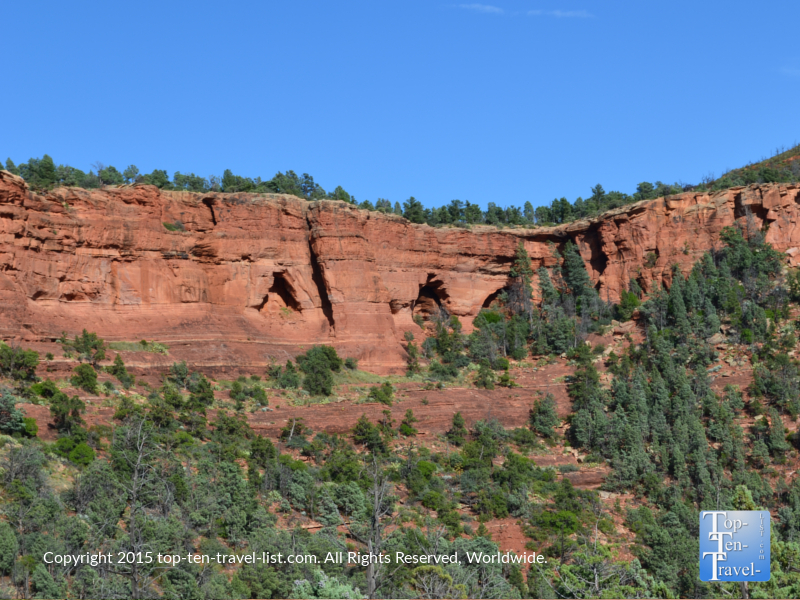 And, at just 2 miles total, the Templeton Trail is a great choice for every Sedona visitor. Wilson Canyon is a short enjoyable hike which starts at the very popular Midgley Bridge. This is one of the most popular destinations in Sedona due to the amazing photo opportunities, access to a number of scenic hiking trails, and short walking distance to the creek to cool down during the hot summer season. Be aware that the parking lot gets packed by mid morning, so you will want to set off on your hike very early to ensure a spot! The Wilson Canyon trail consists of an easy stroll through the shady Red Rock Secret Wilderness. While leisurely strolling this flat trail, you will be surrounded by shrub oaks and Arizona cypress, making it a perfect shady choice for the warm summer season & a nice choice for fall leaf peeping. The trail starts and ends with some magnificent red rock scenery.